Angel Wings Network, Inc. is a non-profit organization, founded in 2008 in Weiser, Idaho. We support courage of all colors! To provide support to cancer patients, survivors, caregivers, family and loved ones who have been touched with cancer, in our rural communities. To grow and be an established outreach location within rural communities. 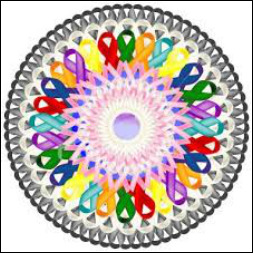 Be a recognized name and place for cancer patients, caregivers, survivors and family to find hope, faith and support. Help educate the public and increase awareness of all types of cancer for support and representation. Many people with cancer in rural areas do not have a close neighbor or social network to provide help as they struggle with the disease. Our focus for 2016 is to establish a relationship with churches and social organizations who will partner as our outreach locations. We will extend our outreach to help cancer patients in rural locations, who may not otherwise know about or have the opportunity to receive the benefits of our program services. Continue to support our network of patient services in rural areas within a 70 mile radius of Weiser. Establish sustainable funding to continue our mission, goals and vision. Continue to develop a vital adult and youth volunteer program. Build strong relationships with key partners such as churches, social and civic organizations, medical facilities, and partnering stakeholders. Talk One-on-One with our volunteer cancer survivors and caregivers who have personal knowledge and understanding of the disease. The Cancer Patient - Talking to someone can be helpful when faced with new emotions and concerns associated with cancer. We are here to listen, provide knowledge, moral support, and share personal experiences. Our programs offer support to you and your loved ones, from the early stages of diagnosis, assistance through treatment, and transition from treatment to recovery and additional support. Caregivers - Typically family or friends who provide care for a person with cancer. If someone close to you has cancer, you may find it hard to know what to say or expect. Concerns associated with cancer can be emotional, physical and/or financial. We offer the caregiver support in areas of emotional support, transportation for your loved one to and from treatment and medical appointments, and helpful advice, resources and information. Family and Friends - Have similar concerns when someone they love is diagnosed with cancer. Family and friends find it hard to know what to do or say in times of need. It is not unusual to find yourself at a loss of words as you struggle to be supportive. We offer helpful advice in person or by phone. Access to our library of books and literature can provide answers to questions and help you feel more comfortable about emotions you may be feeling about loved ones.